A pharmacy was robbed early Tuesday morning. Freeport, NY - October 29, 2013 - Crime Stoppers and the Nassau County Police Department are seeking the public’s help in connection with a Pharmacy burglary which occurred in Freeport, New York. 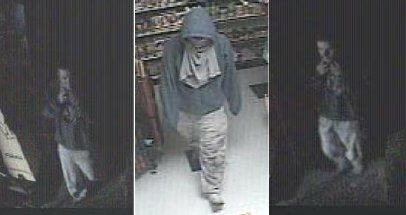 On Tuesday, October 15, 2013 at approximately 4:06 AM, the above pictured subject, described as a male white or male Hispanic, dark hair, hooded sweatshirt, light pants, and no footwear, broke into the Health Mart Pharmacy, located at 179 Atlantic Ave., Freeport. The subject fled from scene a short time later, on foot, with an undisclosed amount of pharmaceuticals. Crime Stoppers is asking anyone who can identify the above subject, or has any information about this crime to call out toll free hotline: 1-800-244-TIPS (8477). All calls will be kept confidential. Crime Stoppers is offering a reward for information leading to an arrest. Subject: LongIsland.com - Your Name sent you Article details of "Information Wanted in Freeport Pharmacy Burglary"